***HOT OFF THE PRESS: Superhero spotted in Stortford! The arrival of a mysterious trailer, notice signs and hyperventilating teenagers could only mean one thing... the elusive Peter Parker was loose on the streets of Bishop's Stortford. Following the conclusion of Infinity War, where Spider-man was seen to crumble to dust, fans were already speculating on the mystery behind the 4th Spider-Man film. 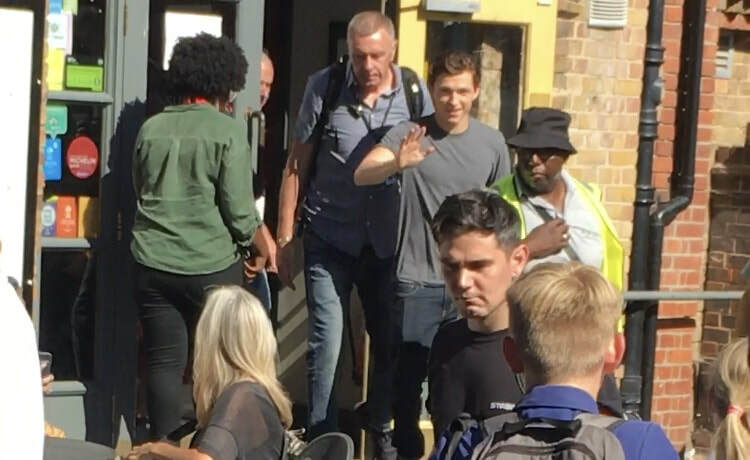 The arrival of Tom Holland (22) sparked fresh interest in not only the Stortford community, but the fandom world. Spider-Man: Far From Home is the new film set to be released in July 2019. These are some exclusive photos fresh from Tom Holland's shoot today. I took them by complete fluke if I'm honest! After school I planned to go for a coffee and when walking to grab my latte, happened upon an enormous crowd of onlookers. This ranged from tiny children baking in full Spider-man onesies to swooning year 10s. Having overheard that Holland was inside one of the Lounges - I waited to see what was going on. After about 10 minutes he appeared out of the doors. I was jerked out of my day-dreaming by the most almighty screams of "WE LOVE YOU TOM!" and that was how the pictures you see materialised. Personally, I am now very much looking forward to seeing the film in 2019 and spotting Stortford's post office and convenience stores. Bishop's Stortford will now forever be our own little piece of Hollywood!